'Kesari' tells us nothing new about the Battle of Saragarhi – this is Indian pride rolled in the form of a Wikipedia article. Akshay Kumar’s movies should now have an automated ‘film-review generator’, because it’s nearly impossible to differentiate one from the other. Over the last two-and-a-half years, he has acted in six nationalist dramas (the equivalent of an Independence Day every five months), centred on similar themes. Kumar playing a patriot, in a film set in pre-independent India, restoring dignity and pride to his fellow countrymen. Which film is that: Gold or Kesari? A middle-aged man, in love with his wife, recognising a social taboo and proposing a tradition-defying solution, empowering millions of Indians. Which film again: Toilet or Pad Man? An undercover agent, not afraid to bend rules, in the service of the nation: Rustom or Naam Shabana? A review generator, as you can see, will save everyone’s time. It is only fair, after all, that his audience gets the same privilege as the star: of easy repetition. 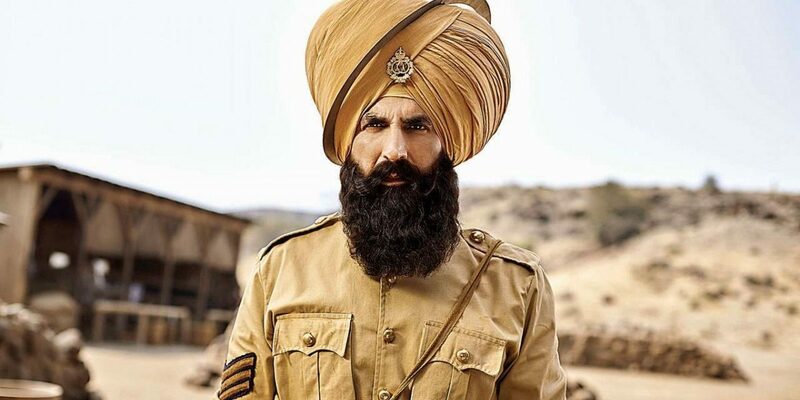 Kesari, set in 1897, follows the events in the Battle of Saragarhi, fought between the 21 Sikh Regiment soldiers, in the British army, and thousands of Afghans. The numbers tell their own story. Add to this the usual Kumarisms – patriotic fervour, unmitigated courage, inspirational belief – and you have a tailor-made film for him. But here’s the thing: Kesari is 150 minutes long, but the bare bones of its centrepiece, the Battle of Saragarhi, isn’t even in the picture for the first 35 minutes. The initial segment, needlessly padded, sets up the metaphorical battleground. We first see the Afghans about to behead a woman for fleeing her husband’s house. Ishwar Singh (Kumar), a Sikh soldier, fires a bullet and saves her. He’s transferred to a different province for disobeying orders, where he’d fight the famed battle. Then we encounter the customary religious pride: Ishwar tells the Afghans that everything is fair game except his turban. There’s more information feeding: the film cuts to a flashback, detailing how Ishwar and his wife, Jiwani (Parineeti Chopra), fell in love and got married (right down to a song awkwardly shoehorned). Then finally, there’s the British and the humiliation of the brown man. In an early scene, Ishwar is castigated by a senior officer for not saluting him. He is commanded to salute thrice, along with apologising each time. Obviously, this isn’t dramatic enough, so the British officer says, “I think it’s the fault of [India’s] soil. It makes people cowards.” The director, Anurag Singh, determined to make you outraged, leaves no room for ambiguity. A few scenes ago, Ishwar, while talking to Jiwani, told her that as a farmer, nothing is more precious and inspirational to him than his piece of land (while holding the soil from his field). Subtle. The film needs this contrived conflict because, as we know, the Britishers, not the Afghans, are the real villains here. All of this could have been smartly condensed in a few minutes, but Singh, unmindful of pacing and tonality, and relying on banal storytelling tropes, allows the obvious to run unchecked. The forced subplots don’t end there though. When Ishwar meets the new band of soldiers, his fellow fighters and compatriots, he’s unimpressed, as they lack motivation and discipline. You know the old trick: conflicts would lead to camaraderie, as the soldiers get ready for the eventual fight. But everything here, it seems, has been written (or reverse engineered) to arrive at the Saragarhi battle, making large parts monotonous and forced. There is, however, some comfort in the fact that Kesari is at least not Padmavat, which portrayed Muslims as cold-blooded brutes. This film, though, goes to the other extent: Kumar’s Ishwar is painfully noble. He wants to help construct a mosque for the Afghans (his subordinates refuse but finally relent). He wants the regiment’s cook, coincidentally a Pathan, to serve water to everyone during the battle (even the enemies). But even these ‘well-intentioned’ parts are so poorly conceived, laced with mawkish scenes and songs, that it’s difficult to register their purported import. The hour-long battle suffers the same fate, too. Devoid of warfare strategy or military ingenuity, Kesari reduces the Sikh-Afghan battle to a simplistic bullet-and-sword fest. The Afghans march towards the fort; they’re fired upon and killed. When Ishwar is single handedly fighting the dozens of Afghans, none of them (for some bizarre reason) use a gun to take him down. Instead they sequentially charge him with a sword (while the others simply form a crowd nearby) and get massacred. Ishwar is stabbed numerous times, and yet manages to defy death for a good few minutes, squeezing some last-minute patriotic sprint. There are plenty of scenes involving fire – the fort is set ablaze by the Pathans, a young Sikh soldier walks in flames – done with such poor CG that you wonder whether it was the lack of intent or budget or smarts (or all of them) that resulted in an embarrassing, borderline-ludicrous, climax. But what is more disappointing is that Kesari tells us nothing new about the Battle of Saragarhi – this is Indian pride rolled in the form of a Wikipedia article.